The HP LaserJet 4300dtns printer is a highly productive, laser printer that delivers precise, superior quality prints that stand the test of time and are fade resistant in nature. It is ideal for workplace and office printing requirements. If you want to make sure the HP LaserJet 4300DTNS printer runs smoothly and functionally at all times, you need to clean it regularly and replace maintenance components as and when required. Rest assured, all of the results produced are rapid, clear and reliable. The HP LaserJet 4300dtns printer comes with a productively functional processor and high RAM. This ensures each and every print produced is effortless and superior in quality. It offers you a print speed of 43 ppm on A4 sized paper while it can be set to print seamlessly at a moderate pace. The printer comes with a network card, and it has a paper capacity of 1,100 pages. The HP LaserJet 4300dtns printer is easy to setup and offers good value for your money. Its toner cartridges are big and produce a sizeable number of pages. It is one of the best printers if you are looking for cost effectiveness, speed and dependability. It does not require a long time to process commands and starts printing when it is initially installed and setup. Users can be assured that it carries out seamless printing requirements from the word go. The printer is easy to maintain and does not cause too many problems during its shelf life. The HP LaserJet 4300dtns printer comes with a delicate fuser and some users report that it breaks easily. If, for instance, a single staple that is attached to the paper enters the printer, it can easily rip or cause damage to the fuser film. Although this printer is great for bigger printing jobs for more specialised printing or more detailed colour prints, there are other printers that will be better. 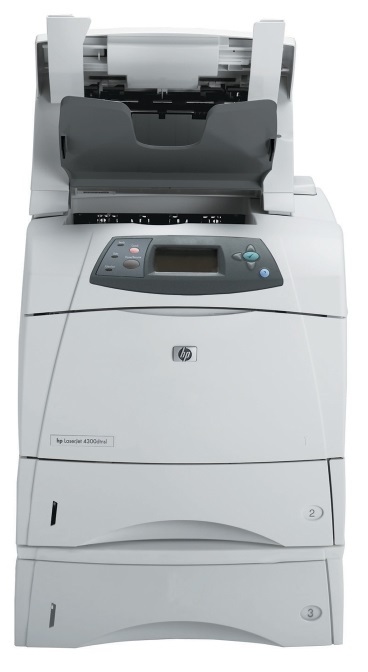 The HP LaserJet 4300dtns also doesn’t have the ability to copy or fax.